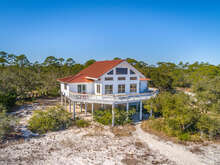 Point To Remember is a spacious, 3-bedroom, 2-bath beachfront home on the most private stretch of beach that Alligator Point has to offer. Vaulted ceilings, bright colors and open common living areas give guests plenty of breathing room. Front entrance opens into the large kitchen/dining/living area with a large laundry room to the east. Also on the east end is the master bedroom with king bed and private bath. On the west end of the kitchen are the 2 additional bedrooms with shared bath. One bedroom has 2 twin beds and the other has a king-size bed. Sliding doors off of the living room open onto the sunroom (cooled with a separate window unit air-conditioner) which houses 2 additional built-in twin beds and a foosball table. Exiting either the sunroom or the master bedroom leads you to the open sundeck. This house has "just the right amount" of beach. Not a long hike to the water's edge and not too close for comfort. Great beach for surf fishing! Beds: 2 King, 4 Twin. High speed internet with WIFI. Nationwide free long distance including Canada. Now a Pet-FriendlyUnit! No Smoking, Please.